I am not so patiently waiting for the hoards of green tomatoes in my garden to ripen and the basil plants to grow large enough so I can start to pillage them for pesto. As much as I try to wait for the significantly better homegrown stuff this time of year, I absolutely could not stand it any longer and went to the store for a bunch of basil and some heirloom cherry tomatoes. If you haven't made homemade pesto before, give it try. You cannot beat the freshness. Place basil and garlic in the bowl of a food processor and pulse until roughly chopped. Add the pine nuts and parmesan and pulse again until combined. With food processor running, drizzle olive oil through feed tube of processor. Run until well combined. 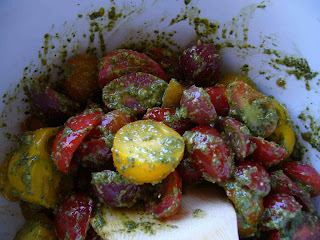 For this heirloom tomato salad, I tossed about half the pesto with a mixture of heirloom cherry tomatoes. Finish with a sprinkling of salt and enjoy!